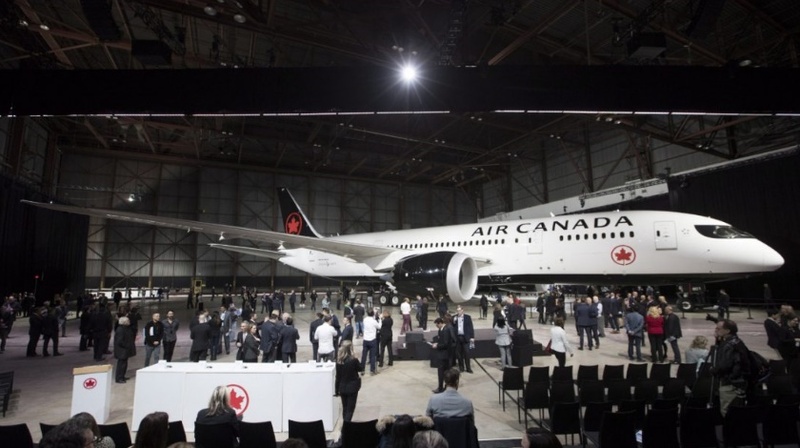 In simultaneous events in Toronto, Montreal, and Vancouver, Air Canada revealed its new livery and branding, in an even described as “the future of Canada’s flag carrier.” Air Canada also introduced new uniforms, menu items, and wine choices at the events. The new livery was designed in conjunction with branding agency Winkreative and features a white upper fuselage, black tail and underbody, black engine nacelles, and a striking black “mask” surrounding the cockpit windows. Air Canada’s iconic red maple leaf rondelle returns to the livery after a 24 year absence: on the tail, on the inner part of the nacelles, and on the belly (visible when a plane flies overhead). Two of the airline’s Airbus A321s and one Boeing 787 -8 were painted in Peru, Indiana, and flown to Vancouver, Montreal, and Toronto late on Tuesday evening. To maintain secrecy and frustrate late-night plane spotters, the main features of the new livery were covered with removable decals. After landing, the planes were quickly hidden in the airline’s hangars to prepare for the unveiling just after noon on Thursday. Air Canada was founded in 1947 as Trans-Canada Air Lines, and became Air Canada on January 1, 1965. This is the airline’s sixth livery since the mid-sixties. Between 1965 and 1993 there were three variations of a red cheat line, red tail, and white maple leaf rondelle design, followed by a white fuselage with a dark green tail and red maple leaf for roughly a decade. The most recent livery, introduced in 2004, featured a pearlescent light blue fuselage and shaded blue tail, with a red maple leaf and red titles. It will take Air Canada between three and four years to repaint the more than 300 aircraft in its fleet with the new design. “All of our 787s and 777s will be done over the next 18 months,” said Ben Smith, president, passenger airlines for Air Canada. He added that many other airplanes in the fleet are coming up on for a scheduled repainting, with approximately 100 planes expected to be completed each year. Later this year, the airline will begin its transition from Airbus narrow-bodies to the new Boeing 737MAX series, and those planes, along with Air Canada’s upcoming Bombardier C Series jets, will be factory-delivered with the new livery.